HomeAll EventsAvenue of Flags-Volunteers Needed! All events for Avenue of Flags-Volunteers Needed! Volunteers needed to help set up the Avenue of Flags! 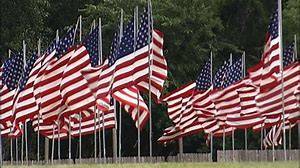 Dates: May 1st: Loyalty Day May 19th: Armed Forces Day May 28th: Memorial Day June 14th: Flag Day July 4th: Independence Day September 3rd: Labor Day If you are willing to assist setting up the flags, please be on the East side of City Park at 7:00 am on the dates listed above. We retire the flags at 5:30 pm.